Review: 2013-11-26, pretty good finish but it is not enough to get three stars: Antonio Tarver vs Mike Sheppard gets two. Antonio Tarver, 43 years-old, entered the fight with a record of 29-6-0 (20 knockouts) while Mike Sheppard had a record of 21-15-1 (9 knockouts). 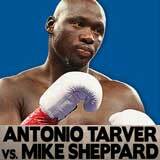 Tarver vs Sheppard is valid for the interim NABA heavyweight title. Watch the video!